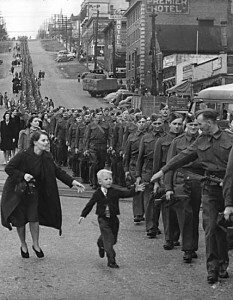 Figure 6.17 A British Columbian regiment prepares to depart from New Westminster, 1940. On 1 September 1939, Germany invaded Poland, which triggered a declaration of war on the part of France and Britain on 3 September. Both New Zealand and Australia declared war on the same day. William Lyon Mackenzie King’s government, however, held back for four days. This delay was entirely about optics. The government wished to demonstrate to Britain and, more significantly, to Canadians that the decision to go to war was one that was made by Parliament in Ottawa and it was one that was endorsed by French and English Canadian politicians alike. King feared a repeat of the divisive experience of the Great War and that fear guided his actions throughout the Second World War. The delay of four days had nothing to do with a lack of preparedness — in fact, the government was vastly more prepared for war (at least organizationally, if not materially) than was the case in 1914 — nor did it reflect concern about what the Americans might do. King was committed to supporting Britain against Germany regardless of Washington’s position. The point was to exercise the autonomy that had been won in the Statute of Westminster (1931) and enter the war as a free democracy. This was not cause for celebration. Unlike August 1914, there were no raucous and patriotic parades in the autumn of 1939. Anyone over the age of 24 would have some recollection of the Great War and the parents of those men and women most likely to serve in the armed forces would keenly recall the costs of the war that was meant to end all wars. There was, too, the recollection of profiteering and corruption from the previous war. Of course, there was also the memory of economic good times, rising wages, and a return to prosperity. It was on this prospect that many Canadians hinged their hopes. As in 1914, of course, optimists in 1939 predicted a short war that might be resolved at the bargaining table sooner rather than later. From September 1939 to May 1940, Canada — along with the rest of the British Commonwealth, France, and the other Allied Nations — was on the sidelines of what became known in French as the Drôle de guerre, in German as Sitzkrieg, and in English as the Phoney War. There was so little in the way of actual warfare going on that King was able to call an election for March 1940, which he won easily. Events in the winter and spring of 1940 were to dispel any possibility of a negotiated peace. While the Allies built up their resources, Germany attacked and annexed Denmark and Norway. On 10 May 1940, the Wehrmacht finally turned its attention to the French Republic, which it invaded after storming through the Netherlands and Belgium. The blitzkrieg assault allowed the Germans to capture the majority of Allied troops stationed in France, although some 300,000 (including a Canadian battalion) escaped via Dunkirk. This was a disaster of the first order for the Allies. Paris was in enemy hands, France bisected into the occupied north and a puppet state in the south, centred on Vichy. The Alliance at this stage consisted principally of the British Commonwealth and whatever resistance armies were able to either escape occupied Europe or disappear into underground movements. Comfortably spread across northern and central Europe, the Germans turned their guns on the USSR, launching an attack in June 1940. The role of Canada and Newfoundland in the war at this point was principally to supply Britain with resources necessary for survival during a long siege and to prepare for a German invasion of the British Isles. Supply vessels, escorted by battleships, poured out of Montreal, Halifax, and St. John’s. The Royal Canadian Air Force (RCAF) played a key role training British pilots and engaged in the defence of the UK during the Battle of Britain. Apart from occupying Iceland on behalf of Britain in 1941, however, Canadian troops saw little action. Many were stationed in Britain, anticipating a German sea invasion that never came. Others were deployed to Newfoundland (recently put back under British administration) and to the West Indies. The War Measures Act converted Canada overnight from a confederation into a unitary state; the government overrode or supplanted most of the normal procedures of peace; it became the largest and most important employer of labour; it used its fiscal capacity and monetary powers to effect maximum war production, borrowing billions, raising billions by taxation, and then bringing into play a reserve power by borrowing many millions from the banking system to inflate the economy to full war capacity. From a nation burdened with crushing rates of unemployment, Canada was transformed into one of the world’s leading industrial economies, a major producer of food and ships, a leader in aircraft and munitions production, and a state with a finger in many pies. Figure 6.18 Minister of Munitions and Supply, C.D. Howe, tours an aircraft plant in 1941. Unlike in 1914, when Britain’s declaration of war meant that Canada was automatically at war as well, in 1939 Ottawa delayed declaring its involvement for four days. Prime Minister King’s primary concerns were to avoid reopening the wounds that fractured Canada in 1914-18. Canadian involvement at the outset was small, although Canadian troops were part of the evacuation of France via Dunkirk. Creating an administrative structure that would mobilize the economy for an effective total war effort was a first priority. British Columbia Regiment 1940 by City of Vancouver Archives / Claude Dettloff is in the public domain. The Hon. C.D. 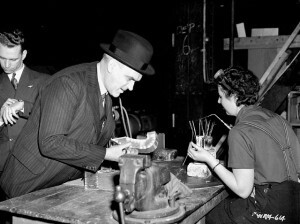 Howe speaks to a woman worker at an aircraft factory (Online MIKAN no.3195719) by National Film Board of Canada. Photothèque / Library and Archives Canada is in the public domain. 6.10 Canada Goes to War by John Douglas Belshaw is licensed under a Creative Commons Attribution 4.0 International License, except where otherwise noted.